I discovered some inspiring work today, or rather a creative friend pointed me to the work of Leah Buechley. She's currently a PhD student at the University of Boulder. Her area of focus is to combine technology and textiles and what super creations she's coming up with, and she's also making it approachable for others. 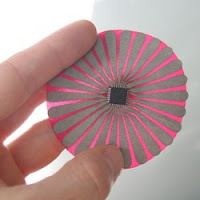 Some of her projects use fabric-based iron-on circuits also known as 'fabric PCBs' (Printed circuit boards), some small electronic sequins. Its a wonderful creative combination of sewing craft and technology. I love her efforts to make accessible science with textile with such projects as math handbags, where she offered a Science Discover workshop for 11-14 year old students could use her graphing program to create their own math graph bags and other items. Leah's philosophy of wanting to combine science and technology with more 'feminine' activities (as she puts it) is close to my own intentions. In the summer I blogged about the concern I had when my kids at science camp were becoming bored of boats, boats, boats, or planes, planes, planes, they needed more of Leah's philosophy injected into the plan. 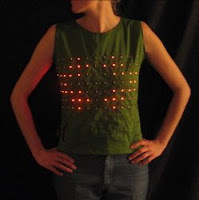 I can not do justice to the breadth of inventiveness of Leah's work and highly recommend taking a look at her projects including LED clothing, sewing circuits, quilt snaps, LED bracelets. I myself might actually invest in some of the electronic sequins - my girls would certainly love to have something other than buttons on the clothes I make for them (btw I am not the dress maker my mother was but can just about sew a dress but my speciality is Halloween costumes where impression over accuracy is what matters! ).